I entered a competition on the Olive Branch Facebook page (where I confessed to using olive oil mixed with descaler to clean up Roman coins) and was delighted when I found I had not only won a bottle of Olive Branch olive oil (which WON’T be used for coins) but also a signed copy of this gorgeous book. Not having posted a non-fiction book review before I thought I would! The premise of this book is to challenge the perception of Caribbean cooking as just ‘Jerk Chicken, Rice and Peas’ and it certainly manages that. Well organised into types of recipe such as ‘One Pot’ or ‘Sweet Things’ rather than individual foods, it is beautifully produced. Within the recipes are ingredients that anyone can obtain and where there are unusual elements where I thought ‘Oh, I haven’t heard of that’ such as amchar masala, the easily made recipe for them is included at the end of the book. I love the slightly faded title and headings so that it feels as if the Caribbean sun has bleached some of the writing. The photographs illustrate that this is not a ‘cheffy’ book, but one that has recipes easily cooked by anyone. 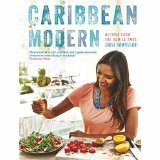 However, there is more to ‘Caribbean Modern’ than the recipes. Shivi Ramoutar provides a fascinating background to the food with insights into the geography and history of the Caribbean as well as practical advice about tackling the cooking. I shall certainly be taking up the Trinidadian concept of ‘liming’. ‘Caribbean Modern’ is published by Headline and is available from Amazon and all good book shops.